Like Slim Pickens in “Dr. Strangelove or: How I Learned to Stop Worrying and Love the Bomb” the Republicans might as well hold on, enjoy the ride and act excited about what their doing. This entry was posted in Cartoon, Conservative, Humor, Politics, Republican and tagged Cartoon, conservatism, Politics, republicans, Trump. Quite a contrast between Iraq elections of a decade ago and those today in America. This entry was posted in Cartoon, Conservative, election, Politics and tagged Cartoon, conservatism, election, Humor, Politics. Who’s responsible for the rise of Trump? Donald Trump is storming through the Republican primary to the surprise of just about everyone. It seems as though the worse the behavior, the bigger the following. We discussed this in an earlier post so we won’t replay that here. But who’s to blame for Trump’s rise? 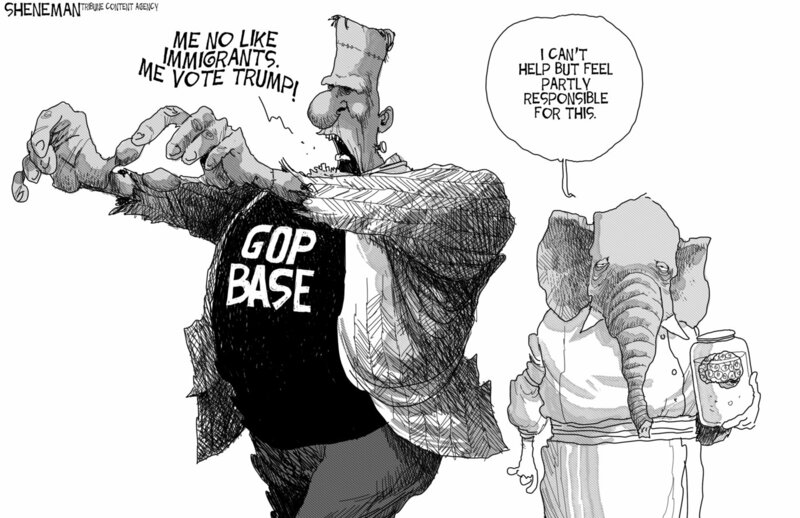 If you look at recent editorial cartoons, Frankenstein’s monster is the latest metaphor used to explain it. Just check out the examples below. 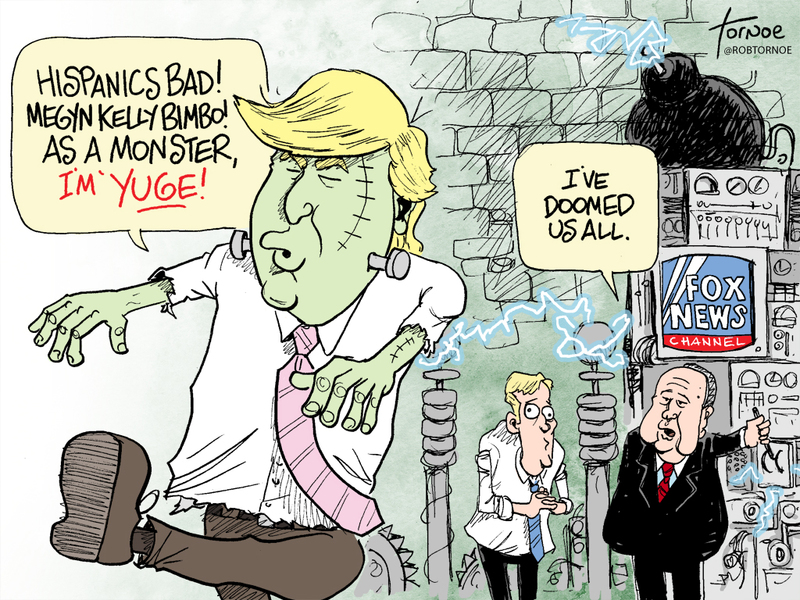 The Republican establishment and Fox News appear to be popular. But we think there’s a simpler explanation. Voter’s want something the opposite of what we currently have. Unfortunately with the pendulum having swung so far in one direction, the kinetic energy during it’s reverse course will swing us too far along an about-faced bearing. Trump is the anti-Obama, but not in a good way. This entry was posted in Cartoon, Conservative, Politics, Republican and tagged Cartoon, conservatism, election, Humor, Obama, Politics, Trump. In response to the deaths San Bernardino, there was a noticeable difference in how those running for the office of President responded through Twitter. So in summary, if you’re a Republican candidate you offer condolences, concerns for those suffering and encouragement to law enforcement. If your a Democrat candidate you’re looking for what’s in it for yourself as a vote getting tool. If the Democrats want to do something about gun violence there are plenty of places to start but empty rhetoric only says “look at me, I’m pounding my fist to show I care.” Since their bold statements imply that they know exactly the reason behind this tragedy then we’re all anxious to hear what brilliant piece of legislation would have prevented this horrible act in California, a state that already has some of the toughest gun regulations in the country. But maybe like climate change, talking about it is enough to stem the tide of all evils. This entry was posted in Cartoon, Humor, Politics and tagged candidates, Cartoon, democrats, election, gun control, republicans, tragedy. What if one-sixth of the population was discarded? • For every 1000 live births in the United States, 210 abortions occur. • One million souls each year perish due to abortion as a way to end an unwanted pregnancy. • Half of all pregnancies in this country are unwanted. This entry was posted in Cartoon, Humor and tagged abortion, Cartoon, Enough is Enough, Humor, Obama, Politics, pregnancy. Thanksgiving, a time for …. politics? Our fearless leader suggested we spend a little quality time this Thanksgiving mixing politics in with our turkey and fixin’s. Nothing says love, togetherness, and holidays more than a heated discussion over gun control. Isn’t he satisfied enough with tearing the country apart that he doesn’t need to have families fighting as well? This entry was posted in Cartoon, Humor, Politics and tagged axe, Cartoon, gun control, holiday, Humor, Obama, Thanksgiving, turkey. Obama isn’t exactly inspiring confidence. Even listening to his rambling you’d think it was a middle schooler trying to convince classmates that he’s the right man for class presidency, complete with plenty of “ums and uhs” to fully sell his commitment. Middle school students basically just wanted free stuff so maybe that’s his target audience, or democrats. Although, we’re sure there’s an army of unicorns just around the corner that Obama’s preparing to unleash on the unsuspecting bad-guys-with-good-media-skills ISIS. This entry was posted in Cartoon, Humor, Politics and tagged Cartoon, ISIS, Politics, terrorism, unicorns.